What is Elbow Bursitis (Olecranon Bursitis)? Olecranon bursitis is the proper name for the inflammatory condition ‘elbow bursitis’. 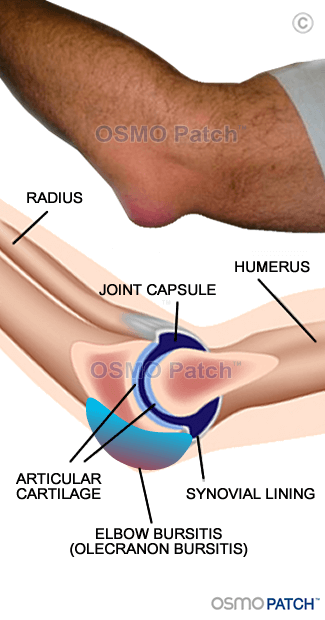 Elbow pain due to olecranon bursitis occurs when a small bursa within the elbow (which normally acts as a small cushion between bones and tendons) becomes inflamed and swollen. This can occur for several reasons which will be discussed below. Another name often given to this condition is ‘Poppy Elbow’ due to the large lump that may appear on the elbow. As mentioned above, the elbow is very susceptible to injury. Below are some of the common causes for elbow bursitis. Repetitive strain and stress to the elbow such as from playing sports, lifting weights or resting elbows on hard surfaces for long periods of time. Sudden impact such as from a fall, sports injury or an accident. Natural wear and tear of the elbow joint. Infection. If there is heat, redness, swelling and pain in your elbow there may be an active infection. It is best to seek treatment from a medical professional straight away if you suspect an infection. What are the Symptoms of Bursitis in the Elbow? There may also be a limited range of motion in the elbow. It is always best to visit a qualified medical professional if you suspect that you have bursitis in the elbow prior to starting any treatment in order to get a proper diagnosis. While elbow bursitis can be assessed by a physical and visual examination it is best to have an x-ray and ultrasound to properly confirm the diagnosis. Your doctor may also feel that blood tests or aspiration of some of the fluid is required if they suspect an infection or to rule out any other possible causes or co-existing conditions. Are there any exercises for elbow bursitis that I should or shouldn’t be doing? Should I be applying ice or heat for elbow bursitis pain? Are there any Natural Treatments for elbow bursitis?